The Rashtriya Janata Dal (RJD)-Congress ‘mahagathbandhan’ (Grand Alliance) announced its seat-sharing arran­gement for 40 Lok Sabha constituencies in Bihar on Friday, ending days of uncertainty among alliance partners. 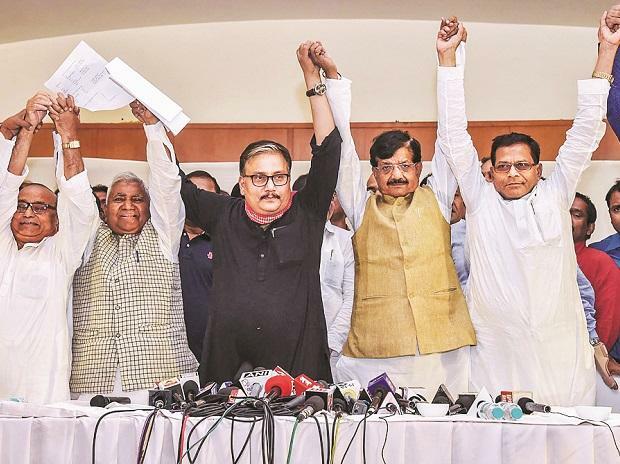 Announcing the pact, RJD Bihar President Ram Chandra Purve said his party will contest 20 seats, while the Congress will field its candidates in nine constituencies. Meanwhile, Upendra Kushwaha’s Rashtriya Lok Samta Party (RLSP) got five seats and former Chief Minister Jitan Ram Manjhi’s Hindustan Awam Morcha (HAM) and Mukesh Sahani’s Vikassheel Insan Party (VIP) have been given three seats each. The RJD has also offered one seat to the CPI from its quota. “In another important decision, it’s been decided by the RJD leadership that Sharad Yadav will contest as a RJD candidate in the upcoming polls and would merge his party, Loktantrik Janata Dal, with ours after the election,” RJD MP and national spokesman Manoj Jha told reporters in Patna on Friday. Sharad Yadav floated LJD in May last year after parting ways with Bihar Chief Minister and Janata Dal (U) national president Nitish Kumar. The agreement came into existence after a long series of meetings among the partners in the last few days. Talks were repeatedly stuck over unwillingness of the RJD to offer more than nine seats to the Congress, while the grand old party didn’t want less than 11 seats. The deal was struck after RJD supremo Lalu Prasad agreed to give one Rajya Sabha seat to the Congress. The Grand Alliance, however, has not announced any candidates. The first list of candidates is expected to come in the next couple of days. The seat-sharing agreement comes almost a week after the NDA announced constituencies for its three allies in Bihar. The JD (U) and the BJP are contesting on 17 seats each, while the Lok Janshakti Party will field candidates on six seats.